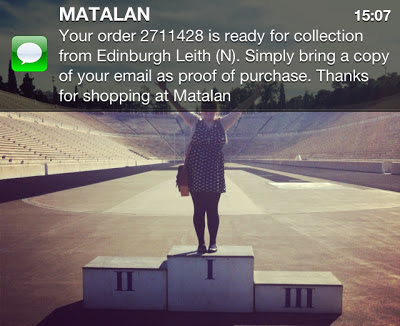 Matalan have recently launched a new service - Matalan Click & Collect - which aims to take the hassle out of waiting on on deliveries, by letting you collect your parcel from your local store (and not have to waste hours sitting about waiting on the postie!). I've been eyeing up a few bits & pieces from their homeware section for a wee while now (seriously, look at these jars! & these ones! Love! ), but was won over by clothes (and justified it by saying - it's spring! I need a new wardrobe!). I ordered a navy cardigan*, cream lace dress* & denim shirt* and opted to pick them up from one of the Edinburgh stores. It was super easy to navigate around their site & check out (I've actually never bought anything online from them before, just in store), and it told that I'd get an email letting me know when I could pick up my items... which would be within three days. So far, so good! Ahh - is it really obnoxious to have myself as my phone wallpaper? I promise I don't normally! The very next day I got a text telling me that my order was ready to collect, so on my next free day I nipped into the store, showed the confirmation email on my phone (no need to worry about printing things out) & collected my parcel. Super easy, and no ridiculous drive to a delivery office that only opens during working hours! The only danger with Click & Collect is that as soon I was in store I thought - oh, I might as well have a wee wander round the shop & try things on... wouldn't hurt (etc) - and ended up buying two new dresses! (This jersey dress in two different fabrics). I would have actually bought a third one in the same cut (which is super flattering on me! ), but they didn't have my size in store... perhaps that's one for my next online order! Overall, this was a super easy (& fun!) experience. I hate hate hate missing parcels... and it's great to have another option for ordering online (especially when it's so speedy). Thanks Matalan! Disclaimer: I was gifted credit to use on items of my choice from Matalan. All opinions my own! (It really was super quick). 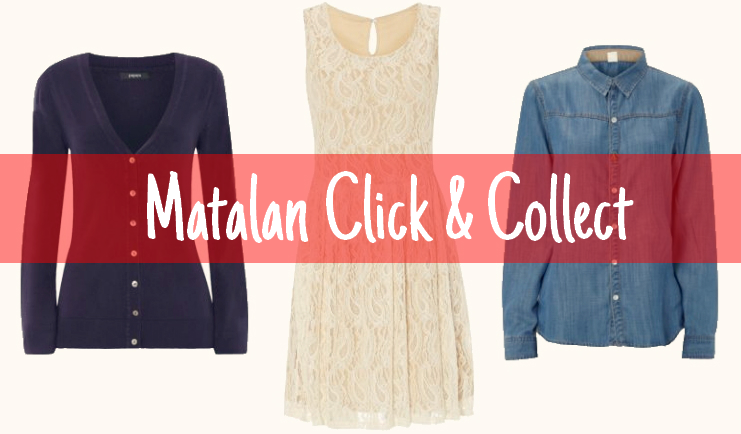 I LOVE everything you bought, I never think to check Matalan for online shopping but I will from now one. Sadly I live no where near a store so this service would only work for me if I knew I was going to be in the city.